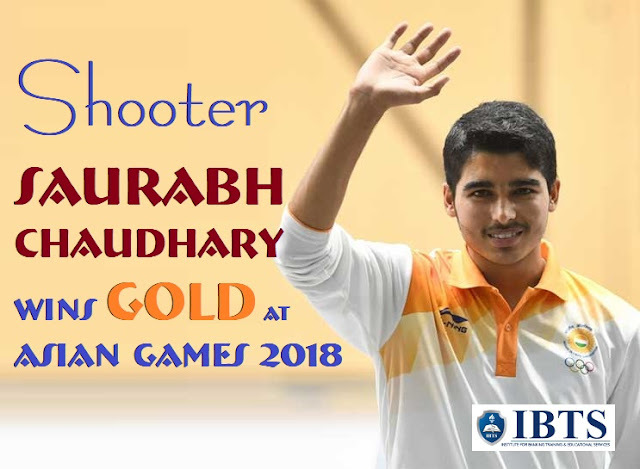 Indian shooters Saurabh Chaudhary (16-year) bagged one gold and one bronze medal (Abhishek Verma) in the Men's 10-metre Air Pistol event at the 18th Asian Games in Indonesia. Saurabh claimed the Asian Games Record as well with 240.7 points to finish above Japan's Tomoyuki Matsuda. Earlier, first was won by Bajrang Punia and the other was bagged by Vinesh Phogat. Serbian tennis player Novak Djokovic (31-year) became the first player to win all nine Masters 1,000 tournaments with a victory over Roger Federer in Cincinnati. Djokovic beat seven-time champion Federer 6-4 6-4. Earlier, Djokovic had lost the Cincinnati final to the Swiss on three previous occasions. Former Deputy Governor of RBI, Shri Subhash Sheoratan Mundra (left the RBI in July 2017) has been appointed as Independent Director on the Board of India Bulls Housing Finance Ltd (IBHFL) for three years. Presently, Mr Mundra is on the Board of BSE Limited and DSP Blackrock Investment Managers Private Limited. India Bulls Housing Finance (IBHFL) is the country’s second-largest housing finance company. Mundra, a Post-Graduate from the University of Poona, used to be the Chairman of Bank of Baroda and an Executive Director at Union Bank of India. The Food Safety and Standards Authority of India (FSSAI) has constituted a three-member committee headed by B Sesikeran (former director of National Institute of Nutrition (NIN) to look into the draft food labelling and display regulations. The regulations have proposed making red colour-coded labels mandatory on packaged food products which are high in fat, sugar and salt contents. FSSAI is likely to push more and more companies to make similar voluntary commitments in the coming days. It had proposed mandatory red-label marking on such packaged food products which are high in fat, sugar and salt contents. The Northern states have decided to set up a joint secretariat at Panchkula for data and information sharing to effectively fight the drug menace. The decision was taken at a meeting of Chief Ministers of Northern States (Punjab CM Amarinder Singh, Haryana CM Manohar Lal Khattar and Uttarakhand CM Trivendra Singh Rawat and Himachal Pradesh CM Jai Ram Thakur) in Chandigarh. The meet was attended by senior civil and police officers from Rajasthan, Delhi and the union territory of Chandigarh. A veteran journalist, lawmaker and peace activist Uri Avnery (94-year) passed away at Ichilov Hospital in Tel Aviv. Avnery was also one of the first Israelis to actively advocate for the establishment of a Palestinian state, more than 70 years ago. He was also editor-in-chief of the iconic liberal weekly, Haolam Hazeh, for 40 years. Avnery was the author of several books about the Israeli–Palestinian conflict, including 1948: A Soldier's Tale, the Bloody Road to Jerusalem (2008); Israel's Vicious Circle (2008); and My Friend, the Enemy (1986). According to the Receivables Exchange of India (RXIL), the Hindustan Aeronautics (HAL) has become the first public sector enterprise to make a transaction on the ‘TReDS platform’. The Hindustan Aeronautics Ltd (HAL) executed its first digitized invoice discounting transaction on RXIL TReDS platform when it accepted the digital invoice uploaded by Narendra Udyog. RXIL is a TReDS platform promoted by the National Stock Exchange, Small Industries Development Bank of India, State Bank of India, ICICI Bank and Yes Bank. Mr SK Arora (Additional Director of Health) has been awarded the prestigious WHO World No Tobacco Day 2018 Award for his extraordinary contribution towards tobacco control. Mr Arora was presented the award by Henk Bekedam, WHO India Country Head. According to Global Adult Tobacco Survey-2 (GATS 2, 2016-17), the prevalence of tobacco use has reduced by 27% in Delhi as compared to 17% for the rest of India on an average. It is awarded every year by WHO to individuals or organisations alike in each of six WHO regions for their accomplishments in the area of tobacco control. The ten-day festival of the historic Esala Maha Perehera has begun in Kandy (Sri Lanka) with a grand procession. The procession set off from the biggest Buddhist temple in Sri Lanka, Sri Dalada Maligawa. The Esala Perahera is one of the oldest and grandest of all Buddhist festivals in Sri Lanka, featuring dancers, jugglers, musicians, fire-breathers and lavishly decorated elephants. This is held in Esala (July or August) which is the month that is believed to commemorate the first teaching given by the Buddha after he attained enlightenment. According to (National Aeronautics and Space Administration) NASA, scientists have found frozen water deposits in the darkest and coldest parts of the Moon's polar regions. Scientists used data from NASA's Moon Mineralogy Mapper (M3) instrument aboard the Chandrayaan-1 spacecraft, launched by the Indian Space Research Organisation (ISRO) in 2008. Enough ice sitting at the surface within the top few millimetres water would possibly be accessible as a resource for future expeditions to explore and even stay on the Moon. According to the Home Ministry notification, No ATM (Automated teller machine) will be replenished with cash after 9 PM in cities and rural areas (6 PM) & Naxal-hit areas (4 PM) from next year (from 8th February 2019). The private cash handling agencies must collect money from the banks in the first half of the day and transport notes only in armoured vehicles. Two armed guards will accompany crisp notes in transit as per a new directive issued by the Home Ministry. The new Standard Operating Procedures (SoPs) will come into effect in view of the spurt in incidents of attacks on cash vans, cash vaults, ATM frauds and other internal frauds leading to the increased sense of insecurity. There are over 8,000 privately owned cash vans plying across the country and they handle over 15,000 crore rupees daily on behalf of banks. In April 2016, UPI version 1 was launched. Pakistan’s new prime minister Imran Khan has named former ICC president Ehsan Mani as chairman of the Pakistan Cricket Board (PCB). Earlier, Najam Sethi resigned as chairman of the board. He had been on Shaukat Khanum Memorial Cancer Hospital’s Board of Directors for the last six years. Mani has worked in various capacities for the International Cricket Council (ICC) and the PCB. The Pakistan Cricket Board controls and organises all tours and matches undertaken by the Pakistan national cricket team. The PCB also runs its own cricket league Pakistan Super League (PSL) played in Pakistan and United Arab Emirates.